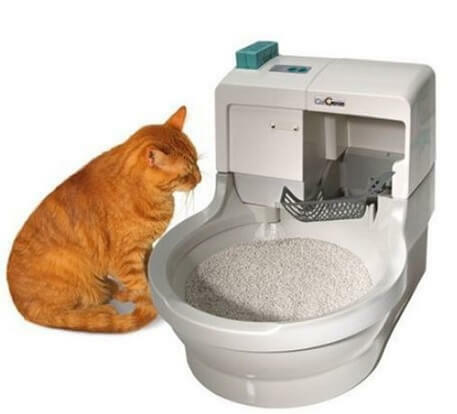 The CatGenie Self Washing Self Flushing Cat Box is probably one of the most unique cat litter boxes available on the market right now. If you have been looking for something that closely resembles a household toilet, then this is certainly the right litter tray for you. But is it’s design suitable for your home? Is it something that your cat will be comfortable doing its business in? Here we will look at how the CatGenie Self Washing Self Flushing Cat Box works, and see if its strengths and weaknesses make it a worthwhile purchase. No Cleaning Required: With the CatGenie Self Washing Self Flushing Cat Box, you never need to worry about clearing up cat litter again. All you have to do is connect the litter box up to your drainage system, and the waste will be flushed away when you cat has finished doing its business. 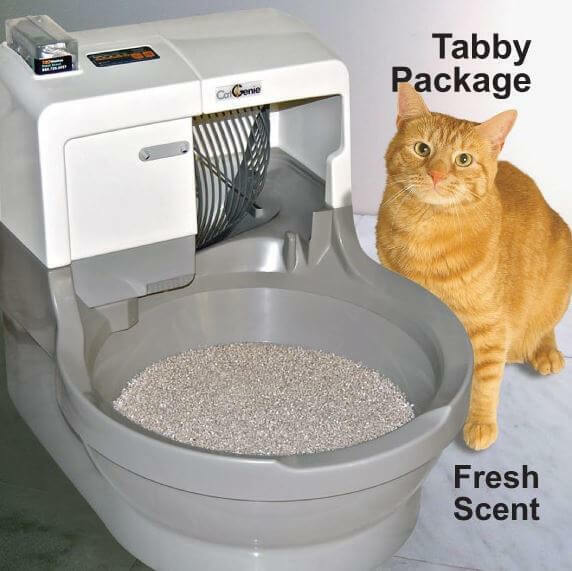 You don’t even need to worry about buying cat litter either, as this cat box comes with a special gravel that cleans itself after every flush. Suitable For Several Cats: If you have more than one cat then this self-cleaning litter tray is ideal for you. It has a built in timer that you can set yourself, so then the tray can flush itself before another cat decides to use it. This is a pretty useful feature, especially for people who own cats that insist on using a freshly cleaned litter tray every time they pay a visit. You can change the delay on the flushing system at any time so then it flushes more or less frequently, depending on how often your cats need to use it. Hygienic And Odor-Free: The great thing about this self-cleaning litter tray is that it is probably one of the most hygienic models available to buy. Because it flushes through the drainage system like a normal toilet, the cat’s waste can be disposed of quickly and easily. The gravel that is also used instead of cat litter is designed to help reduce odor, so then you don’t end up with a bad smell in your home every time your cat uses the litter tray. Difficult To Calculate Timer: While this litter box does have a timer you can set so then you can customise when it flushes, it does have a timer that makes things a little difficult. You have to decide how many times you want it to flush over a 24-hour period, which means you need to guess how often your cat needs to use the litter tray. 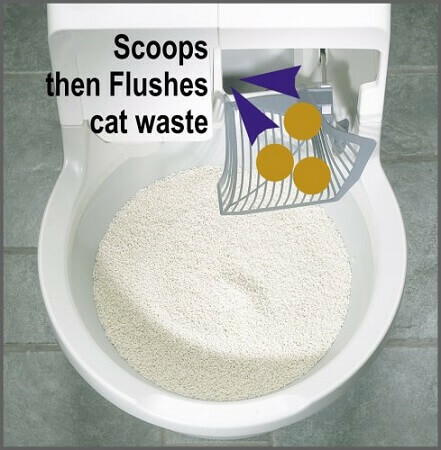 This can be a bit of a hassle, but you might be able to figure it out if you know roughly how many times you have to scoop out the cat litter a day. Error Alarm Goes Off Easily: Some customers who have bought the CatGenier Self Washing Self Flushing Cat Box have complained that the machine tends to omit a loud beeping sound whenever there is an error. Sometimes this can be over not having enough water in the bowl, or it could be because it thinks your water pressure is too low. Both of these problems and indeed some of the others will be quite a hassle to deal with, particularly if the machine is going off when there is nothing wrong. For that reason, if you do purchase this machine you need to make sure that you perform regular checks to make sure everything is running okay. Granules Blocking The System: One of the other problems with the machine is that some of the granules can get into the system, which creates a block and makes the water level raise quite high. This would set off the beeping alarm, but on other occasions it may not do, thus resulting in a blogged system even though you didn’t know there was an issue. Again, this is something that you unfortunately have to keep an eye on to make sure it doesn’t happen. Try and check the system after every flush to see if some of the gravel has got caught up in the piping. You have two options when it comes to where you can connect the hose for drainage. The first choice is to connect it to the same drainage pipe where your washing machine is. If you do this, make sure that you have connected it properly so then it doesn’t block straight away. The other option is to put the other end of the hose down the toilet. You can either leave it there for you to flush whenever you want, or you can push the pipe down into the toilet pipe so then you don’t need to flush at all. If you are planning to do this, it has to be a toilet you are not using, such as a downstairs toilet. Never flush with the hose in the toilet. If you don’t have that much space around your washing machine and toilet at home, there is no need to worry. The hose that is provided with this litter box is quite long, so you should be able to store it quite far away from your appliance or toilet. In some cases, depending on the layout of your home, you will be able to keep the litter box in a different room with the hose discreetly tucked away. If you are able to handle plugging this into your drainage system, the CatGenier Self Washing Self Cleaning Cat Box is certainly a purchase worth making. To have something that is the closest you will ever come to having an actual toilet for your cats is opportunity that can not really be missed. If you want the entire process of cleaning up after your cats taken out of your hands, then this is definitely something worth purchasing. Don’t Let a Disaster Turn into a Cat-astrophe! Why Does My Cat Cry at Night? Eric Wood is a freelance writer living in the north of England. He has been working as a writer since the age of 16, and since then he has written for many websites and newspapers. 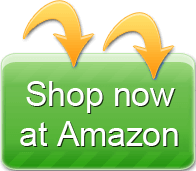 His debut novel, Stealing The Planet, is now available to download on Amazon. catsupplies.net © 2013-2019 All rights reserved.